There are many ways to grow your own food in your apartment. Vertical gardening uses any available space along a sunny wall to grow vegetables, herbs, flowers, and root crops in suspended containers. It can be done anywhere as it takes little space, and also simplifies maintenance and harvest. The wall needs to be strong enough to support the weight of the grown vegetables, and a protecting sheet along the back of the garden is recommended as a vapor barrier. Here you can find over a dozen of simple and more complex vertical gardening designs that are shared online. Trellises have been used for centuries to grow climbing plants like squashes and beans. Vining plants give a larger yield and make for a cleaner garden when they are vertically grown. It’s important to place them so they won’t shade the rest of the garden. The posts should be sunk at least 24″ down to support the weight of the heaviest pumpkins. Here you can find 15 Inspiring DIY Garden Trellis Designs. An old bike tire rim can be an alternative to a more traditional design. You can either purchase specially designed trays to grow herbs vertically, or use pallets to make your own trays with the help of some plywood and landscaping cloth. For the pallet design, nail or staple plywood to the pallet, then wrap the back, sides, and bottom with landscaping cloth. Fill it with soil and lay flat, then fill the slats with seeds or preferably seedlings. Hang up the pallet once the plants are well established, wait at least two weeks for seedlings. A pallet or part of a fence can provide space for attaching clamps that can be screwed into pots. An alternate pallet system uses the back side of the pallet. Boards are nailed under the crossbeams to hold up soil, turning the pallet into row boxes. Old gutter sections can be repurposed similar to window boxes. Make drainage holes in the bottom of the sections to pass down the water to lower levels. Leave enough space between them to get sufficient sunlight. More details can be found here: DIY Hanging Gutter Garden. Garden Towers can be simple and more advanced. The plants can be grown in soil, as well as in an aquaponic system that pumps a mineral solution up the tower and drips it over the plant roots. The Garden Tower Project has a great simple design that has a central compost container where you can place your kitchen food scraps as a fertilizer. A simple herb garden design is using recycled bottles suspended on strings for easy maneuvering. It’s recommended to grow plants in plastic bottles labeled with the recycling numbers of 1, 2, 4, and 5. Here’s an example that uses hardware cloth and a frame to create a very sturdy trellis for tomatoes. You can find instructions on how to make this project here. This design is also great to start a succulents garden as a living wall. Succulents are very low-maintenance plants and living walls can help reduce the amount of cooling needed in a house. Just mist the board from time to time. Recycled nylon felt units come with easy to use pockets for root-wrapped plants. A built-in drip irrigation system runs along the top of the wall to water the pockets. Leftover water falls into a drain line at the bottom. A major distributor of this system is PlantsOnWalls.com. They describe the following process that allows this system to work well. A burlap sack can be hung on a nail and filled with dirt. You can make canvas pouches or use an old shoe organizer and get something very similar to florafelt. You can learn more about this design here. Here is the same concept taken up one step further. This type of garden would be great for smaller plants like lettuce and strawberries. Pyramid gardens can be simple or more complex. Here’s the same sort of design, but with much better solar options. The bins are four inches thick. You could fill in the entire bottom and fill with soil or put in four inch containers and rest them on the cross sections. An old staircase can be transformed into a vertical gardening system. The stair steps provide a good way for excess water to drain off down the unit. 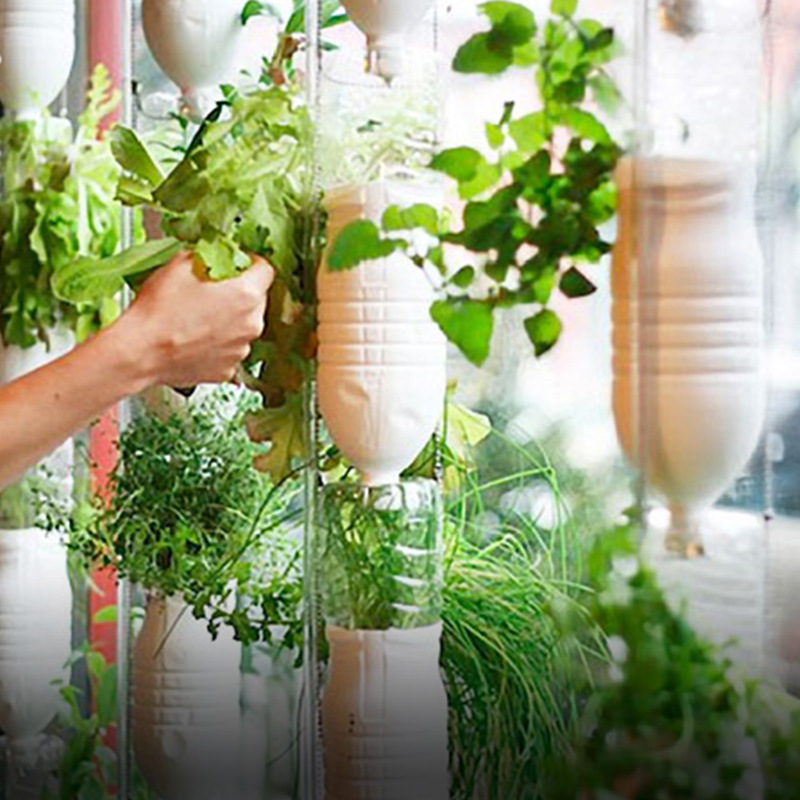 There are many many more vertical gardening design ideas that you can use and share your insights about. Please feel free to share any other vertical gardening designs here.